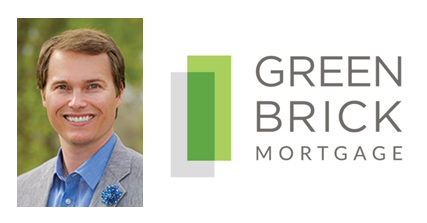 New PrimeLending affiliated business, Green Brick Mortgage, LLCSM (NMLS: 1765654), is excited to welcome new Managing Director, John Olson. “I’m incredibly proud to be a part of this growing organization and I’m ready to lead our team to success. I believe in the power of developing genuine relationships with customers and giving them the respect and care they deserve. Overall, my mission is to help our customers feel empowered to achieve their homeownership goals by serving them with integrity, reliability and clear communication.” says Olson. As an esteemed member of the mortgage industry for over 17 years, John is a business visionary with a clear strategy for growth and success. He also understands the importance of focusing on the small details that make the home loan experience positive and memorable for aspiring home buyers. Green Brick Mortgage is currently hiring seasoned loan professionals to help clients achieve their homeownership goals. Contact us today to learn how you can join this talented team of home loan experts. Green Brick Mortgage is a Dallas-based residential mortgage originator offering fixed-rate, adjustable-rate, FHA, VA, conventional, and jumbo, refinancing, home-purchase, and home-improvement loans. At Green Brick Mortgage, we help our clients land their dream home by providing the knowledge, support, and hassle-free mortgage process they deserve. Green Brick Mortgage offers a comprehensive range of home loan solutions in the Dallas-Fort Worth metroplex. PrimeLending Ventures Management, LLC, owns a 51% interest in Green Brick Mortgage, LLC, and a 49% minority interest is owned by GRBKMP, LLC, an affiliate of Green Brick Partners, Inc. PrimeLending Ventures Management, LLC is a wholly owned subsidiary of PrimeLending, a PlainsCapital Company (NMLS: 13649) Green Brick Mortgage is a member of the Hilltop Holdings Inc. (NYSE:HTH) family of companies. © 2018 Green Brick Mortgage, LLCSM (NMLS: 1765654). Equal Housing Lender. This is not a commitment to lend. Restrictions apply. Green Brick Mortgage, LLC, is a subsidiary of PlainsCapital Bank and is exempt from mortgage banker licensing/registration in Colorado, Florida, and Texas. This story was originally published by Prime Lending and can be viewed here.